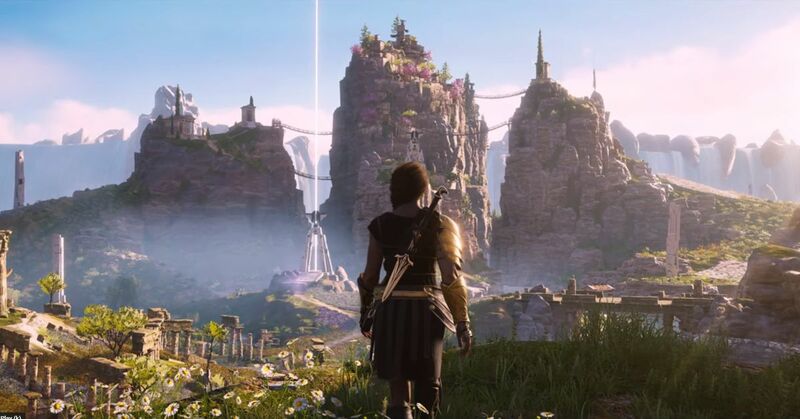 Assassin's Creed Odyssey was epic in scale well before being expanded with its initial burst of post-release content. After the most recent episode, we felt the scope had gone from epic to exhausting, and that we finally had our fill of this entry. The launch trailer for the upcoming expansion, The Fate of Atlantis has us rethinking that position. The footage is striking, with grand vistas and lots of colorful vegetation and ancient technology. The story is pushing the series further from its historical setting into the fantastic and colorful settings of myth. The expansion will be spread across three episodes, starting with "Fields of Elysium," an adventure set in the idyllic afterlife locale of the Greek myth. According to Ubisoft's announcement, the following two episodes will go deeper into "the great mysteries that lie within the ancient realm of the gods." The arc will introduce ability enhancements, allowing players to modify existing capabilities capabilities. And it will feature a bundle of gods and mythological beasts to meet and battle. After the main game, players will have to complete the quest Between Two Worlds, the mythological main game story arc, and the Heir of Memories, the Lost Tales of Greece quest line that is available after completing the former questline. Finally, they must have reached character level 28 or above. 1; players' progression using the shortcut will not carry over to the main game save, and they will not be able to achieve achievements. The Fate of Atlantis is included in Odyssey 's $ 39.99 season pass, and will be available by itself for $ 24.99. The first episode will launch on April 23. The following episodes – "Torment of Hades" and "Judgment of Atlantis" – will be available in mid-2019.